Field Maple Barn at Ashlin Farm Barns in Dunholme, near Lincoln sleeps 10 people. 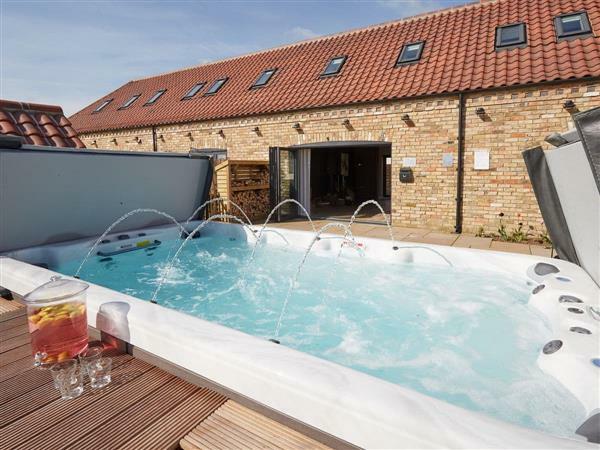 Ashlin Farm Barns near Lincoln can be found just 5 miles from the centre of the city; these four luxury holiday barns are nestled on a quiet, no-through country lane with the owners living nearby. Each barn is arranged around its own private inner courtyard, and they also have a swim spa, with the facility to comfortably seat 10 people, which can be used as a hot tub to relax in after a day exploring the area. For those who enjoy wildlife, there is a 50-acre nature reserve further down the lane, close to the barns, where there are excellent walks and opportunities for bird watching. On site, there is a large well-stocked coarse fishing lake which has seating, making this an ideal place to relax and enjoy the tranquillity of the surroundings and while away the days whilst fishing. Holly Tree Barn (ref UKC1353 [Holly Tree Barn]), Red Oak Barn (ref UKC1354 [Red Oak Barn]), Field Maple Barn (ref. UKC1355) and Wild Cherry Barn (ref UKC1356 [Wild Cherry Barn]) can be booked together to sleep up to 40 people. All properties at Ashlin Farm Barns near Lincoln: Oil underfloor central heating, electricity, bed linen, towels, Wi-Fi and logs for wood burner included. Travel cot and highchair available on request. Welcome pack. Large garden with garden furniture and barbecue. Hot tub for 10 (private). Sheltered courtyard with garden furniture. Coarse fishing on-site (free of charge, licence required). Private parking for 7 cars. No smoking. Please note: There is an unfenced lake, 550 yards away, and two unfenced ponds in the grounds. For a better idea of where Ashlin Farm Barns - Field Maple Barn is, you can see Ashlin Farm Barns - Field Maple Barn on the map below. Ashlin Farm Barns - Field Maple Barn is in Lincolnshire; should you be on the lookout for a special offer, you can find all the special offers in Lincolnshire. It's always worth checking to see what is on offer at the moment. Do you want to holiday near Ashlin Farm Barns - Field Maple Barn (UKC1355), you can see other cottages within 25 miles of Ashlin Farm Barns - Field Maple Barn; have a look to find your perfect holiday location.